To enter to the Boulangerie St-Méthode Under the Sun Contest, entrants must reside in Canada and have reached the age of majority. 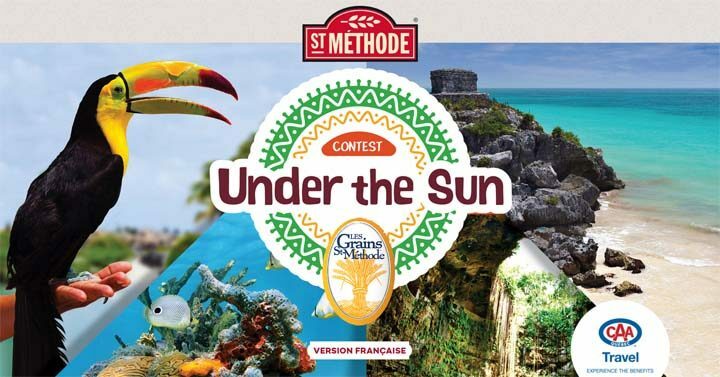 The Boulangerie St-Méthode Under the Sun Contest ends on October 15 at 11:59 p.m.
Entrants must complete the entry form available at concoursbsm.ca and indicate their first name, last name, email address, phone number, gender and age, as well as the bar code of a participating Les Grains St-Méthode product (Multi-cereal bread (500 g), 100% whole wheat bread (500 g), 9 whole grains bread (600 g), Quinoa bread (550 g), 100% whole grain with sprouted wheat loaf (550 g), Club 100% whole wheat loaf (675 g), White loaf (500 g), Chia bread with ground flax (600 g)) sold in a participating store in Canada. A total of four (4) weekly prizes will be awarded during the four (4) weeks of the Contest Period. Each weekly prize consists of a trip for two (2) people under the sun. The prizes will be awarded to the winners in the form of a travel credit worth three thousand Canadian dollars (CAD $3,000) stipulating that the credit is applicable on a 7-night stay package in one of the sunny destinations offered by Voyages CAA-Québec, including airfare and accommodations, redeemable at Voyages CAA-Québec. The total prize value is twelve thousand Canadian dollars (CAD $12,000).